The church, as a local body of believers, has become something that many Christians have decided, for whatever variety of reasons, to reject, despise and leave. You hear more and more these days about how people are dissatisfied with their church fellowship, the leadership or something gone wrong. We can always find a "good" reason not to like something. The church is the bride of Christ; it is the body of which He is the head. Therefore it is not to be ignored or dismissed. We are called, created and made to be a part of it and to fellowship within it. Now, I'm going to be frank and say the church has caused me and my family to suffer greatly at times but not a single thing done to us has given me an excuse to walk away. The bottom line is, I look at scriptures and they seem so very plain that Christ designed the church, established it, and has called it the body of which He is the head. (Acts 4:8;-12 1 Corn. 11:2; Eph. 1:15-23; Eph. 4:7-16; Eph. 5:22-24; Col. 1:18; Col. 2:6-12; Col. 2:18-19; 1 Peter 2:5-8) Given these references, it seems prideful and, yes, even sinful, to flee from His established plan. 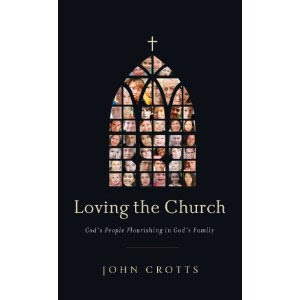 That all established, I received a copy of Loving the Church : God's People Flourishing in God's Family in the mail for review (courtesy of Shepherd Press) several months back. It was unexpected, but I was glad to see it, as it came as a breath of fresh air. It is discouraging to look around us and see people leaving the body left and right. It saddens us to think of it. This particular book is set up as if it is a series of conversations between people in a coffee house Bible study who have come together to express their complaints against the church and to determine what scriptures say about it and what our involvement is supposed to be. Each fictional character in this book has been wounded by the church in some way, or have felt that their family needed something "different" than what the local congregation was offering. As this coffee house group meets, the author unfolds his argument through use of scriptures and conversations with the characters to express the following: the church IS the body of Christ, we ARE called to be joined to it and we are in error when we decide (for whatever reason) to walk away from it. I think what Loving the Church would most like to communicate is that the body of Christ suffers as a whole when we remove ourselves from it. When we segregate ourselves away from the whole - when the hands say that they don't need the arms and the legs say that they don't need the neck - the church loses. And by the way, the Corinthian church to whom Paul was speaking and giving the analogy of the body was not a perfect church, so you can't argue that they were any different than we are today. There were divisions among them and feelings of superiority floating about. Paul was reminding them that in order to function well - and as God intended - that they needed to stick together and work together. God set up a system whereby He intended His people be cared for, through which He intended them to be productive and victorious. How wonderful is it for the enemy that we would segregate ourselves away from one another and remove our gifts and talents from one another? How great is it when I refuse to operate through a spiritual gift to benefit the whole? How cool is it for the enemy, and how profitable for the other side when we say we can make it on our own? And when we know more than our pastor about some situation? How nice is it when we question leadership and the roles that God has designed for His people to be ministered to? Every doubt and every question we raise, every excuse we take to "simply" walk away or detach, is not good! It is not good for the body! It is not good for us as individuals! It leaves us exposed to temptations and weaknesses. I cannot sway you back to the body of Christ if you have left it. But, I would offer this book and some encouragement to explore what scriptures have to say and see what God established and meant for good. Yes, bad and painful things happen within the church. People sin. But that does not give us an excuse to walk away. Rather, when bad things happen, it should drive us each to repentance. When we repent and cry for God's help, He will step into the situation. How could He not want to rescue His bride? If we loved His bride as He called us to, how much more eager would we be to stick with her when the going gets rough? How much more willing would be to extend forgiveness, and to say to the "hand, finger, toe and elbow" that we need them? In fact, we do. Paul said so. The church in America needs the reminder just like the church in Corinth did. The question is - will we listen? For another perspective, Randy Alcorn also recently authored a blog post entitled The Church: Don't Give Up on God's Plan that you might be interested to check out. I've been thinking about this topic a lot lately as a couple of family members have not deliberately left the church so much as just drifted away. With the ability to listen to great sermons online as well as fellowship with other believers online, some may feel less of a need, but it's not the same as meeting with flesh and blood people and having that commitment over the long haul. I've been thinking about doing a blog post on reasons to attend church. You gave me a couple of aspects of this I'd not thought about. I may have to get this book. I don't know if either person I mentioned would read it, but it would be edifying to me as well. I've been passionate about this subject lately too. I just finished reading The Divine Commodity ( http://www.amazon.com/Divine-Commodity-Discovering-Consumer-Christianity/dp/0310283752/ref=sr_1_1?ie=UTF8&s=books&qid=1288017038&sr=1-1 ) -- a non fiction book about how the culture of consumerism has taken over American Christianity. And the church suffers big time for that, while the enemy has a hey-day. Thanks for posting your review, Carrie -- I think I need to read Loving the Church. I definitely need to check this one out. I'm not going to leave, but I do need encouragement from time to time as to why we should bother to hang in there! So,so glad you reviewed this one! It's been on my wish list, and it's an issue close to my heart. Thank you! FYI to Catherine - I stuck that book on my Amazon wishlist. After your comment, Janet (comment below) reviewed it on her site and it sounds like a winner!